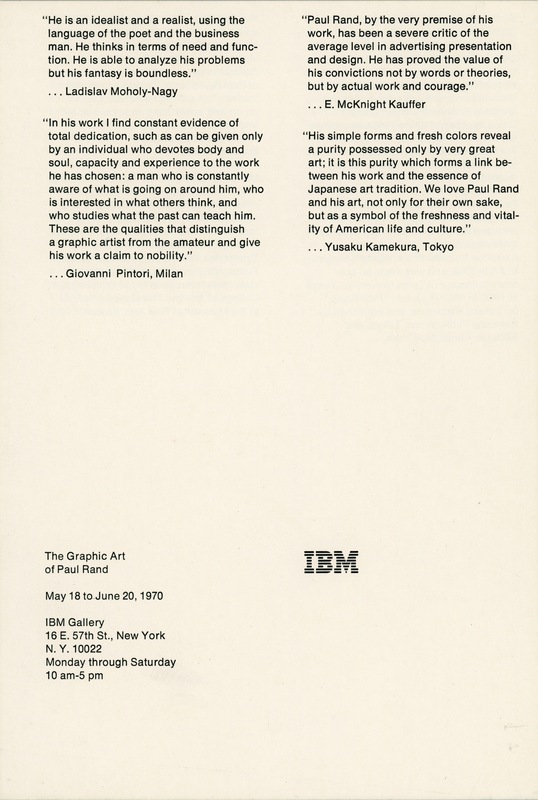 IBM is pleased to present an exhibition of the work of Paul Rand, one of the most innovative and influential designers of the twentieth century. 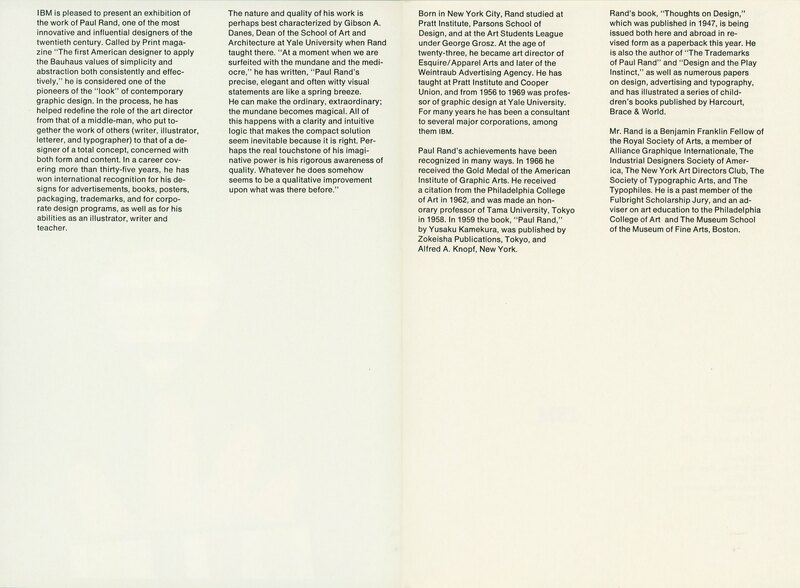 Called by Print magazine “The first American designer to apply the Bauhaus values of simplicity and abstraction both consistently and effectively,” he is considered one of the pioneers of the “look” of contemporary graphic design. In the process, he has helped redefine the role of the art director from that of a middle-man, who put together the work of others (writer, illustrator, letterer, and typographer) to that of a de-signer of a total concept, concerned with both form and content. In a career covering more than thirty-five years, he has won international recognition for his designs for advertisements, books, posters, packaging, trademarks, and for corpo-rate design programs, as well as for his abilities as an illustrator, writer and teacher. Born in New York City, Rand studied at Pratt Institute, Parsons School of Design, and at the Art Students League under George Grosz. At the age of twenty-three, he became art director of Esquire/Apparel Arts and later of the Weintraub Advertising Agency. He has taught at Pratt Institute and Cooper Union, and from 1956 to 1969 was professor of graphic design at Yale University. For many years he has been a consultant to several major corporations, among them IBM. 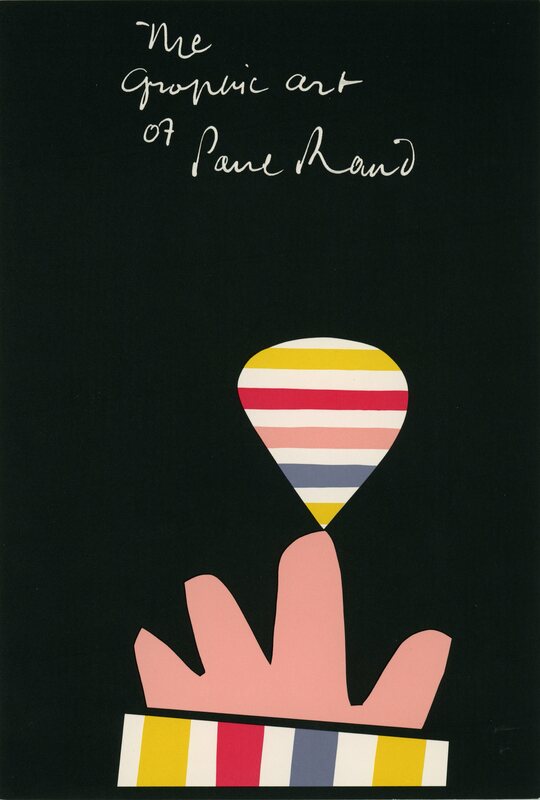 Paul Rand’s achievements have been recognized in many ways. In 1966 he received the Gold Medal of the American Institute of Graphic Arts. He received a citation from the Philadelphia College of Art in 1962, and was made an honorary professor of Tama University, Tokyo in 1958. 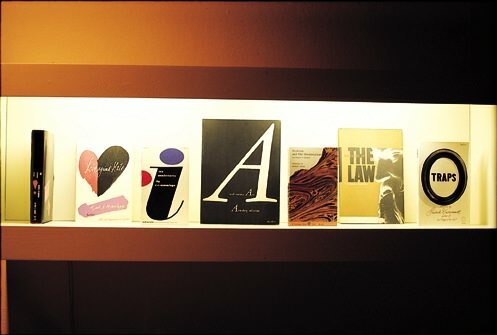 In 1959 the book, “Paul Rand,” by Yusaku Kamekura, was published by Zokeisha Publications, Tokyo, and Alfred A. Knopf, New York. Rand’s book, “Thoughts on Design,” which was published in 1947, is being issued both here and abroad in revised form as a paperback this year. He is also the author of “The Trademarks of Paul Rand” and “Design and the Play Instinct,” as well as numerous papers on design, advertising and typography, and has illustrated a series of child-dren’s books published by Harcourt, Brace & World. Mr. Rand is a Benjamin Franklin Fellow of the Royal Society of Arts, a member of Alliance Graphique Internationale, The Industrial Designers Society of America, The New York Art Directors Club, The Society of Typographic Arts, and The Typophiles. He is a past member of the Fulbright Scholarship Jury, and an adviser on art eduacnation to the Philadelphia College of Art and The Museum School of the Museum of Fine Arts, Boston.